Inspired by sorcerers and mystics. Complete with a widows peak! This wig is the finishing touch you need to complete your look. Long, luxurious, straight, wavy and lightly layered glamorous wig! Featuring a natural looking skin top. Length approximately 26 inches. 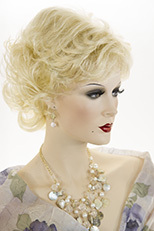 This lovely wig comes in a variety of fun colors. See item details for available colors. Gentle layered waves surround your face, with two shades of hair for an exotic feel. Featuring a natural looking skin top. See item details for available colors. Inspired by Ororo "Storm" from X-Men 3. Mid length razor cut. Featuring a partial skin top with a collar length flip. Think Frankenstein and the monster bride! 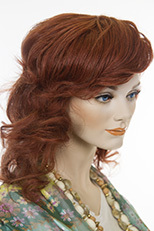 This wonderful wig will make your costume memorable! Black hair with white strips going up each side. 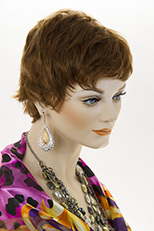 This short curly wig is both fun and flattering and feminine. Long, glamorous layered waves and neon colors blending together to create this feminine coiff. The finishing touch to your costume! Long, straight and dramatic! 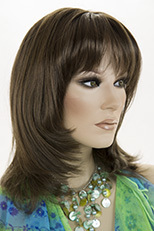 This striking costume wig will make an entrance. Perfect for theater, costume and parties. See item details for available colors. 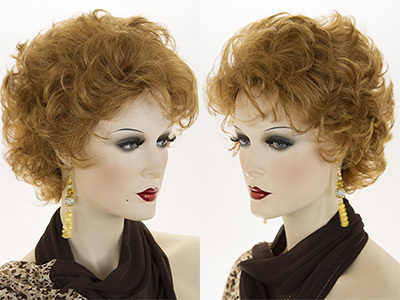 Inspired by Lucille Ball, this striking wig will make your costume memorable. The lovely red hair is put up in a Gibson style do with curly bangs. Fun asymmetrical short style costume wig with strips of neon color! See item details for available colors. Slightly long, layered waves without bangs. Overall length is 27 inches. Striking combinations of fun colors make this glamorous and dramatic! See item details for available colors. Think exotic, fantasy beauty! 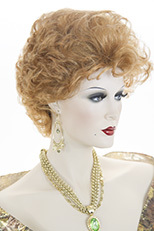 This fun wig is perfect for theater, costume or a party! See item details for available colors. Inspired by Chucky this fun short orange wig will make all sorts of fantasy costumes! Vivid, fun, short, curly and colorful clown wig! Strips of neon curly hair in a variety of colors. See item details for available colors.